The British publisher, Bloomsbury has a web site with a FAQ, excerpts from book reviews, a quiz. It has separate entrances for muggles and witches/wizards. See: http://www.bloomsbury.com/harrypotter/ If you have problems guessing a password, try the one at the bottom of this essay. Reviewers tend to either love or hate these books. They regularly receive either one (the minimum) or five (the maximum) stars by reviewers at Amazon.com; few are lukewarm. Richard Abanes, "Harry Potter and the Bible : The Menace Behind the Magick," Horizon Books, (2001). Read reviews or order this book safely from Amazon.com online book store. Reviews range from "These people would be burning withches [sic] if they thought it wouldn't land them in jail. The same mentality that gave us the Salem witch trials, the Crusades (mass murder of indigenous peoples), the Inquistition, [sic] etc..." to "This book is a must read. Finally, a well-reasoned, rational, thoughtful, articulate, presentation of the concerns so many people have been trying to express..."
Connie Neal, "What's a Christian to Do with Harry Potter?," Waterbrook Press, (2001). Read reviews or order this book. Publishers Weekly reviewed this book, saying in part: "Neal navigates a via media [sic] by offering support to Christians who have decided to boycott the series, but also giving suggestions to parents who wish to read and discuss the books with their children. Spiritual discernment, Neal says, is the key for any Christian and an important quality to help children develop." Ms. Neal comments on her book: "Christians are divided over this issue, but the answer is not to side-step around it. We need to make the most of the unprecedented opportunities Harry Potter affords us. I show you how you can, whether you end up pro or con on Harry, while maintaining unity and civility in the body of Christ." "If you are firmly set against Harry Potter, I won't try to dissuade you, as that is one biblically viable position. However, I will offer you facts to shed light on false rumors, help you protect your kids from real-world occult, help you understand the stories without having to read them, and help you explain your decision to your kids." Positive portrayals: These are reviews by authors who are not conservative Christians, and who evaluate the Harry Potter books as delightful fantasy novels. David Colbert, "The Magical Worlds of Harry Potter," Lumina Press, (2001). Read reviews or order this book safely from Amazon.com online book store. A review on Amazon.com states: "J. K. Rowling fills her books with references to history, myths, legends and literature. Here are the stories behind the stories - - the astonishing origins of magical creatures, the clues to hidden meanings in names, and stories of real-life wizards mentioned in the Harry Potter series." AZ Kronzek and Elizabeth Kronzek, "The Sorcerer's Companion: A Guide to the Magical World of Harry Potter," Broadway Books, (2001). Read reviews or order this book. Intended for ages 9 to 12. It is very highly rated by Amazon.com's reviewers. Amazon says, in part: "From astrology to Grindylow to reading tea leaves to witch persecution, this fascinating volume gets to the bottom of every magical mystery connected with Hogwarts." David B. Mouser, "Harry Potter's Muggles' Guide to Magic," David B Mouwse, (2001). Read reviews or order this book. Two brief reviews: "Absolutely a MUST for a quick and easy reference to the magical world of Harry Potter!" and "My school children love the easy to read format and the illustrations are fantastic." Philip Nel, "J.K. Rowling's Harry Potter Novels: A Reader's Guide (Continuum Contemporaries) - Unauthorized," Continuum Pub. Group, (2001). Read reviews or order this book. The publisher writes: "It features a biography of the author, a full-length analysis of the novels, and a fascinating discussion of what has made them so phenomenally successful." Derek Murphy is a writer and artist from Portland, Oregon, specializing in Christian history. His first book is: "Jesus Potter Harry Christ: The Fascinating Parallels Between Two of the World's Most Popular Literary Characters." He’s now in Taiwan finishing his PhD in Comparative Literature and working on his second book. Jesus Potter Harry Christ is a well-reasoned and meticulously referenced (but not overly academic) non-fiction treatise on religious history, comparative mythology, astrological symbolism, and modern culture. How and why Jesus Christ, who is traditionally considered a historical figure, shares anything in common with the modern re-telling of ancient folklore that emerges in the character of Harry Potter, is the basis for this innovative investigation. 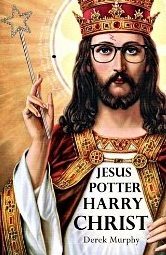 After exploring the religious controversy surrounding the Harry Potter series and tracing the similarities between Jesus and Harry, Jesus Potter Harry Christ dives into ancient mythology, astrology, gnosticism, and Christian history, to see if Jesus can be distinguished from Harry based on the claim that Jesus was a real historic figure, while Harry Potter is obviously a fable. Just how much of the gospel accounts of Jesus are based on pre-existing mythology? Can we find the historical founder of Christianity by removing the mythology from around him? Is there reliable evidence that Jesus Christ was a historical person? Discover how the contemporary fictional hero Harry Potter can help us to recognize and explore the symbolism in Christian literature and establish the critical relevancy of the literary Jesus. Read reviews or order this book safely from Amazon.com online book store. Amazon sells it for $19.95 in paperback and $1.99 in Kindle format. Book reviews quoted in Amish Country Gifts' web site at: http://www.amishcountrygifts.com/potter.html They refer to the first book in the series. Johnathan Zimmer, "Harry Potter and his censors," Education Week, 2000-AUG-2. "Wizards and Mubbles," editorial, Christian Century, 1999-DEC-1.